With these packages, you pay a flat-rate monthly fee. We also offer discounts for physicians with multiple practice locations. There are no long-term contracts. It’s month-to-month and begins after the first two months are paid upfront, allowing our team of marketers to properly optimize your professional business listing on our website for search engines. The Premium Membership includes all the same service features as the Standard Membership with the addition of a customized marketing plan designed by our industry-leading marketing experts to grow your practice. All featured listings will be given the first right of offer to retain their position on a monthly basis. Patient Management System: Patients use our online software to build their own profile so that all their contact and medical information is easily accessible to you. With the help of practice managers from around the country, we’re continually improving our software to bring you the best patient management system. Public Listing: Your personalized profile page provides you with the foundation to capture maximum market share in your local area. As part of our network, you are directly connected to thousands of potential patients searching for legal access to medical cannabis. SEO Profile Page: As a medical professional, marketing your services and maintaining a steady patient flow is imperative for your practice. At MarijuanaDoctors.com, we do it all for you. 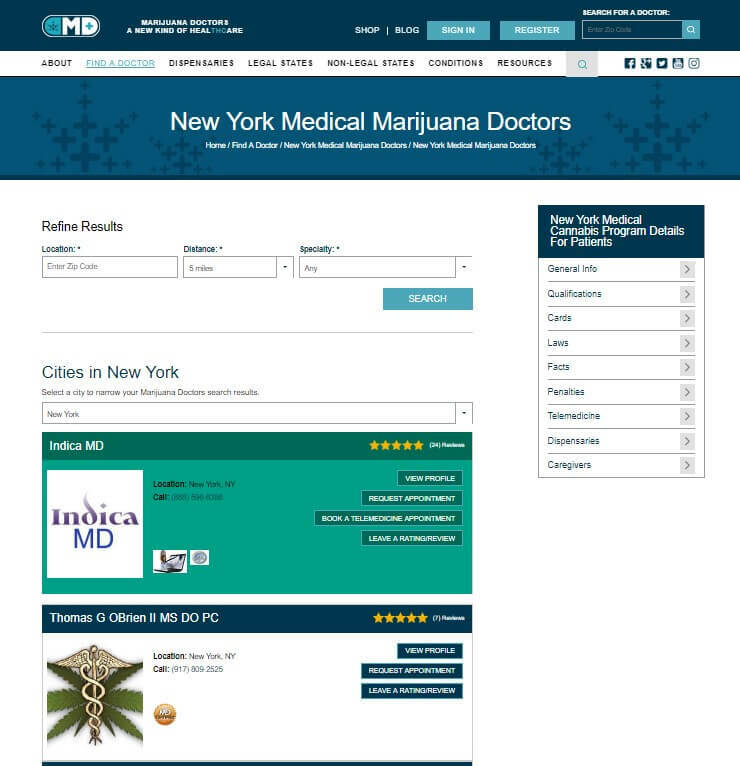 Our website was built on the #1 domain for keyword searches related to “marijuana doctor” and “medical marijuana card.” We will use the same marketing expertise to highlight your practice specifically in optimized searches by patients. Patient Retention Program: Your practice can enjoy peace of mind knowing that all the patients coming into your office are pre-qualified and have already received helpful instructions related to their visit. With our professional customer service team, we will support your practice by confirming and surveying all patients who find you through MarijuanaDoctors.com, assist patients with the appointment requests, and follow-up via email and phone call reminders to dramatically decrease the percentage of “no- shows.” We are a trusted resource for patients to gather information and be directed to the appropriate medical practices, specifically those in our network. Patient Wait List Program: As a Premium Member, you will receive exclusive updates from patients on our waiting list if your state updates the qualifying conditions list. There are thousands of potential patients in our database waiting on these legislative changes. Medical Cannabis Network Educational Kit: Our research team has put together a comprehensive educational guide committed to the advancement of cannabis as medicine covering state-specific laws, federal laws and medical research compiled into a digestible format. When your patients’ certifications are nearing the expiration date, we will contact them on your behalf and remind them to schedule an appointment to renew their certification. MarijuanaDoctors.com Promotional Material: We will provide your office with pamphlets and flyers promoting the use of our website to help educate patients on the medical marijuana industry. Renewal List Contacts: When your patients’ certifications are nearing the expiration date, we will contact them on your behalf and remind them to schedule an appointment to renew their certification. Telemedicine: Doctors now have the ability to log into our telemedicine sub domain in order to see live appointments whenever it is most convenient for the physician. 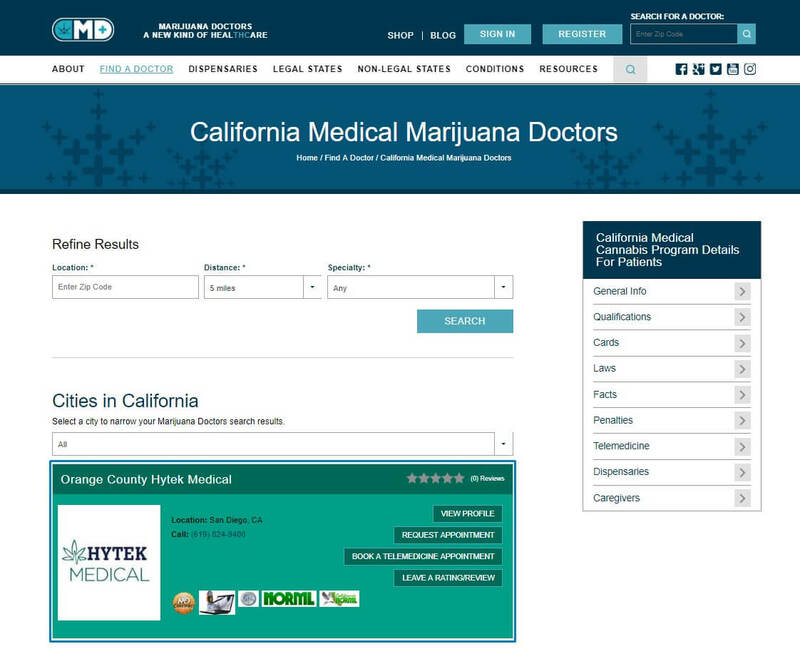 Doctors may schedule appointments via telemedicine or choose to accept the thousands of daily visitors who come to the MarijuanaDoctors.com website looking for the instant gratification of seeing a physician in real time satisfying their desire to receive a recommendation for medical marijuana. Producer/Dispensary: Producers and dispensaries now have the ability to list their location and menu selection with the purpose of helping patients locate and purchase their medicine from an authorized producer, dispensary, clinic or retailer.